Kevin O'Neill has been fired as coach of the Toronto Raptors, the NBA team have announced. In his first year in charge, O'Neill guided the Raptors to 10th place in the Eastern conference - outside the playoff places. Toronto interim manager Jack McCloskey said: "This season fell well short of our expectations. "While the blame for that certainly does not rest on O'Neill and his staff alone, we need a change." O'Neill had criticised the franchise and its players on Thursday, saying the "focus is not on winning all the time." 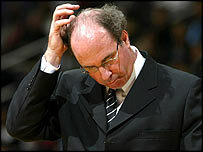 Toronto, who reached the Eastern conference finals in 2001, fired general manager Glen Grunwald earlier this month. O'Neill's four assistant coaches have also been dismissed.